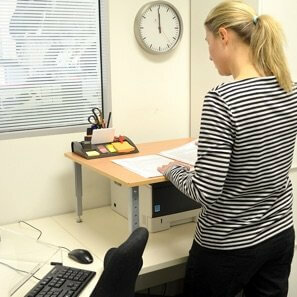 We know that every person and every job is different and no one sit-stand workstation will suit everyone. We hope this will help you to find the solution which suits you. How does it move up and down? – What does it require your body to do? Push? Pull? Reach with your arms wide apart? Pull up? Research shows that on average, a person will change from sitting to standing 3.6 times per day. So that will require at least 6 height changes. Some people change more than this, especially if back pain limits their sitting time. If managing an injury is a reason you want to sit and stand, it is important that the mechanics of the equipment does not aggravate your injury. Keying height. – To know what height you need to key at, measure the distance from the floor to your elbow. This will be the approximate height of the standing keying surface. Cheaper sit-stand equipment does not raise enough for taller people so check the product’s specifications. Is the keying surface strong and stable? – Some sit-stand equipment can be ‘wobbly’. This doesn’t bother some people but is very annoying to others. And some people like to occasionally lean on the keying surface. If you think this is you, you will need something which doesn’t move and is stable. Space for other items. – Do you like your keyboard close or further away? The keying surface of some sit-stand equipment is small or shallow and may not provide very much area to rest your wrists or forearms. What do you use beside the monitor, keyboard and mouse?. How much space do you need for these things? If you regularly need to spread out papers and files make sure there is enough space on the desk/keying surface for these. Will the monitor position be right? – Monitors usually need to be about an arm’s length away with the top tool bar at eye level. Check the specifications to calculate if the sit-stand equipment you are deciding on will allow your monitor to be in the correct position for you. Generally speaking if the monitor is clamped onto the equipment there will be little or possibly no adjustability towards and away from the eyes. Check the monitor will not be too close or too high for your comfort. Cost. – There are major variations on the cost of sit-stand workstation equipment and we all want value for our money. The real cost of workstation equipment should be considered over the years of use. 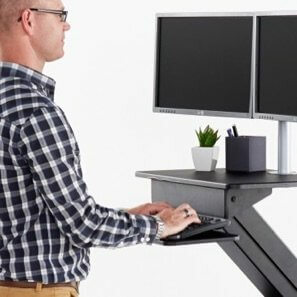 An electric desk costing $775 ÷ 10 years use = $77.5 per year or $1.50 per week. Not much for giving you workstation health and wellbeing.